Hemphill, JH Photography, Spencer, IA. One of the scheduled construction projects for 2014 at the Alton Grain rail terminal in Hillsboro, ND (701-636-5130), was to build an enclosure around the facility’s probe station, in order to get it out of the Red River Valley’s often harsh weather. With that project underway, the company decided also to upgrade its truck management software. Since the time CompuWeigh installed the GMS system at Alton Grain, it has continued to upgrade its technology. Last fall, Alton Grain was able to upgrade to CompuWeigh’s RFID SmartTruck system, which has provided a number of benefits to both Alton Grain and its customers. 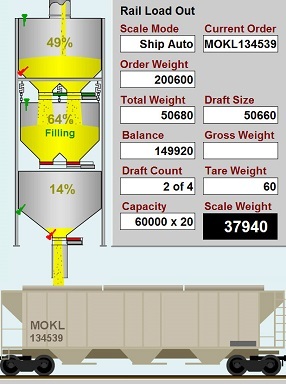 • SmartChoice: Programming that automatically sends trucks to one of three receiving pits via digital message boards based on daily grade factor parameters (per pit, as configured by Alton Grain). • SmartPit: Ability to scan trucks’ RF cards at the pit and sound an alarm, if a truck pulls into the incorrect pit. This prevents mixing of grain. • HMI/PLC Automation Technology: Inputs data from all weighing, grading, and grain receiving equipment and monitors safety sensors such as belt alignment, bearing temperature, and amperage sounding an alert, if any of these exceed safety limits. Truck exits inbound probe station and is directed by the SmartTruck system to one of three receiving pits. • When communication is required, it is much easier to understand drivers now with the SmartTalk intercom system with its noise cancellation technology. • The chances of a truck dumping at the wrong pit has been eliminated with the SmartPit feature. • Trucks no longer are identified incorrectly during the weighing process, if they get out of order. Because the RFID badge is identified automatically by the system, the correct truck always is selected. Tryan says he and his employees are very satisfied and impressed with the new system.